Modern witches have to be very careful and hide their magical abilities--remember the Salem Witch Trials? Better to hide then to start that up again even if you no longer live in Massachusetts! So this family of witches live a normal life-well mostly. Of course Cath can literally talk to cats through thought transference and the three cats have a lot to say-not to mention having to save their humans from themselves and others and literally solve mysteries for them! This is a cute cozy mystery and I already have Book 2 so that should tell you how much I enjoyed it. From USA TODAY BESTSELLING AUTHOR Harper Lin ***New & Improved Version***Relaunch of the #1 Amazon Bestseller! Cath Greenstone, her cousin Bea, and her hippie aunt Astrid live in Wonder Falls, a small town near the mystical Niagara Falls. They run the Brew-Ha-Ha café, and naturally, they’re witches hiding in plain sight along with their three magical cats, Treacle, Peanut Butter, and Marshmallow. When Brew-Ha-Ha's baker is burnt to a crisp, along with their beloved café, Aunt Astrid lets out a big family secret: a powerful spell book, a Greenstone heirloom from the Salem days, has been stolen from its secret hiding spot in the café. 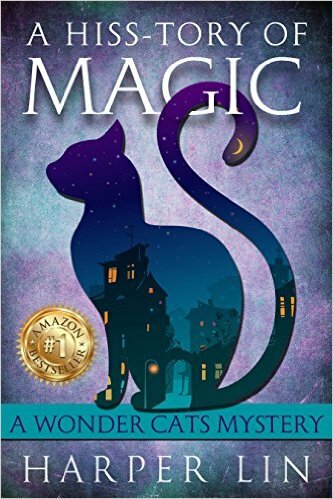 If it’s fallen into the wrong hands, black magic could destroy not only Wonder Falls but the world. A secret society… A new detective with a shady past… A once-bullied local returning to town as a multimillionaire. 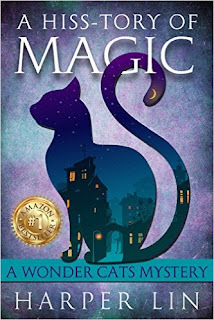 The first novel in a new cozy mystery series featuring modern-day witches and their magic cats. Harper Lin is the USA TODAY BESTSELLING AUTHOR of The Patisserie Mysteries, The Emma Wild Holiday Mysteries, The Wonder Cats Mysteries, and The Cape Bay Cafe Mysteries. When she's not reading or writing mysteries, she loves going to yoga classes, hiking, and hanging out with her family and friends. I love the mystical content of this book. It lets you get away from reality for a little while. That sounds like a really fun read. I want to get a copy of it. This sounds like a fun paranormal cozy series. Of course, anything with cats is even better! Where's the dog love? Why do cats get all the magic power? I love any books with witches ! Must read ! I've really come to enjoy a good cozy mystery. Sounds like a really good book. I love hearing stories of witches and Salem. It's kinda fun that they have to keep their magic under wraps. I imagine that makes for some interesting happenings! This sounds like the perfect book for me to gift to my aunt as she recovers from surgery. She's a huge cat lover, and I know she'd be thrilled to think of her own with magical powers. I love cats - I sure wish mine had some magical powers! This sounds like such a fun book! I will have to pick it up! This indeed sounds like a wonderful cozy mystery read. I love that it has the magical feel to it. My sister would love this one too. Thanks for sharing. I love the title! Too cute. With fall coming a cozy mystery sounds perfect!